If you're into Modern Calligraphy, and have been looking for something to give your work that extra sparkle, you've probably come across the stunning metallic palettes by Finetec (changing their name to Coliro). They have a beautiful range of colours ranging from gold to silver to beautiful rose metallics. With their ingredients of gum arabic and mica-pigments they come out beautifully opaque on both light and dark surfaces. But here's the thing that might seem tricky at first sight. They're neatly packaged in little palettes, that looks more like watercolours than a ready to use ink. How do you get the ink from the palette onto your nib without dipping it? Don't worry, it's a bit more of a process than a ready to use ink. But the results are absolutely stunning and well worth the extra effort. First you add some water to the pigment, let it sit for a couple of seconds or so to let it soften up a bit. After that you want to start to gently mix the water with the pigment. You're looking for a milky consistency (on the top layer, the pigment below is still solid). I usually go between my water jar and the palette a few times. If the ink isn't flowing smoothly I add more water. If I end up with a too watery consistency I just let it sit for a while and let the pigment go back to a more solid state. So experiment and see what consistency works for you. When you're happy with your ink mix you load up your brush and gently paint on the ink on the underside of your nib. Make sure to fill up the reservoir by looking at when the hole is completely covered with ink. 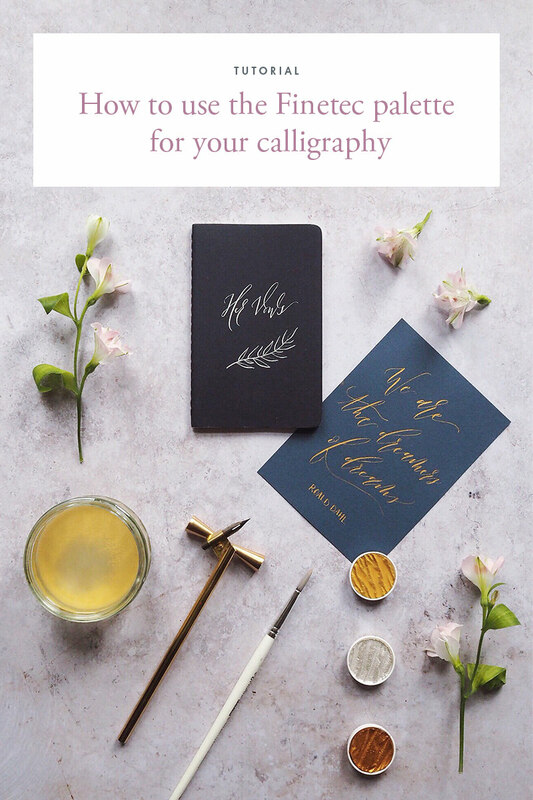 And that's it, you're ready to do some sparkling beautiful calligraphy! Hope you found this tutorial helpful and please feel free to share it with anyone you think might find it interesting and inspiring.